This entry was posted in Website Articles on February 3, 2014 by admin. 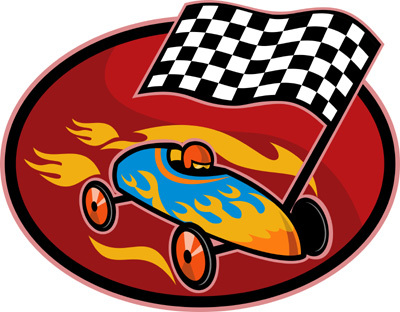 Did you hear the one about the soap box derby? Two 12 year old friends, John and Eric decided to enter. John loved building things, and Eric couldn’t build anything if his life depended on it. John figured if he could build anything, he might as well build his own soapbox car. John went to work, and within 2 weeks, he finished his masterpiece. It wasn’t pretty, but it could move. He saw Eric at the race, and knowing that Eric was horrible at building anything, he bet him five dollars (big money for John and Eric!) that he would win. John was about to become one very rich boy. John asked Eric where his car was. He told him that his dad was bringing it. Just then, his dad rolled it out. It was a thing of beauty. It even looked fast. They went to the starting line, and John took a big, hard gulp. They were off – in the end, Eric’s car obliterated John’s. It wasn’t even close. John built his car himself. Eric hired a professional (his dad). Business owners are oftentimes a lot like John. They built a business, so they figure they can build a website themselves, or at least be savvy enough to find a company who can do it for ultra cheap. The odds are that you have been berated by advertisements on the web and television for “the do it yourself” website, the website that starts at only a 99 cents a month, etc. All of the bigger companies who offer these quick and easy solutions draw in the millions of small business owners that just don’t have a clue. The only ones getting successful by these schemes are those who are suckering the businesses into this. Don’t worry though – if you have been one of them, you are definitely not alone. As a matter of fact, many of Tanner Creative’s clients have been through this as well. Many will try out one of the cheap website alternatives mentioned above, only to find out that the only thing that was effective about it was wasting precious time! After hours upon hours of spending time on doing their own website, they give up, post the site live, and voila! Their sub-par ‘easy template for $100’ creation is on the web. Check out Sandcastle Web Design for creative design solutions. Tanner Creative clients are excited to show their websites to their clients. Wouldn’t it be better to respond to your prospect’s website inquiry of what your web address is, with enthusiasm? To be proud of your website – because you know it adds professionalism and credibility to your company? Mentally visualize the difference between a cheap website, and its professionally developed counterpart. Cheap Alternative – your prospect goes online, and sees something amateurish. They mutter under their breath “is this how the business operates? Perhaps I should go elsewhere!” While they may have been able to scavenge the site and successfully obtain your phone number, your $100 website “investment” just cost you a sale! Professionally Built – your prospect goes online, and sees the beauty that is your website. It immediately puts you at the top of their list of businesses to do business with. It makes them feel good, and smart about doing business with you. Your website sings to their soul! They are now certain that if they do business with you, it will be a home run! They call you up to learn more, and you are well on your way to gaining another client. In the end, a cheap alternative website is the expensive website. It will rob you of future business. A professionally built website attract more clients!